The other day I got tired of basically coming up with random hourly rate estimates for freelancing projects because I actually never sat down to figure out what the hell my hourly rate should be. I found a great blog post How to Calculate Hourly Freelance Rates for Web Design, Development Work and made a spreadsheet with the appropriate formulas. 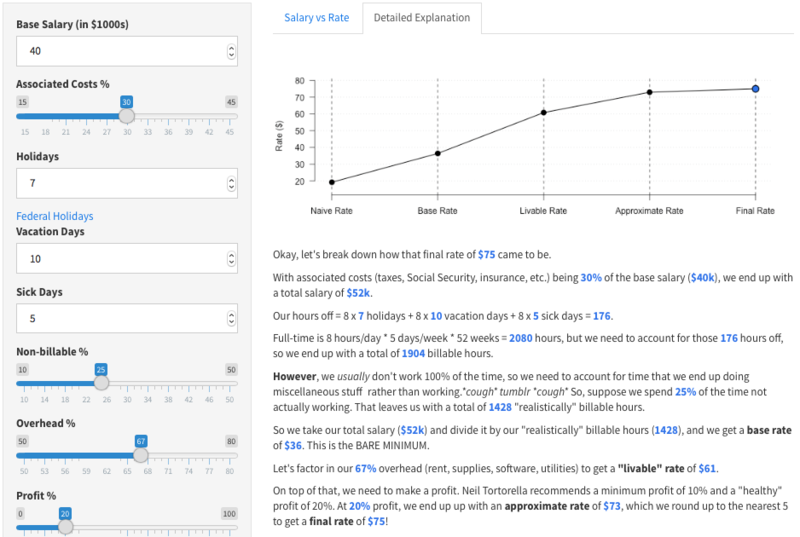 But then I wanted to combine the explanation of the blog post with the dynamic aspect of the spreadsheet. So I opened up R and wrote a Shiny app where you can specify all the different numbers and percentages and it’ll update the plots and details of how the final rate was calculated.